Lately I’ve been a late adopter of new technology. 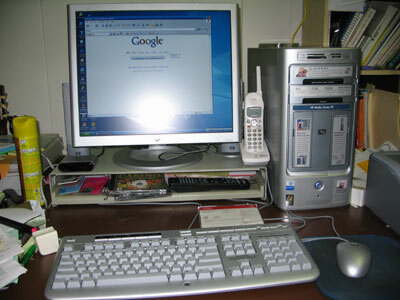 Just a year ago, I had an old Pentium III computer with a dial-up modem. Since then, I’ve gotten DSL and retired the old P3 in favor of a new Pentium D Media Center. Recently, I talked about digital downloads and my feelings about them. I said then I hadn’t used them very much because, well, I didn’t have the state-of-the-art apparatus needed to really appreciate them. I’ve had a four-year old 128MB Rio back when MP3s were pioneering technology. Then came Apple and its iPod, which has become the killer peripheral for digital music. Most of my friends have jumped on the iPod bandwagon, but back then my friends would give me heat for being a person working in IT who only had dial-up. Never mind about digital music. I still had misgivings about digital music, and as I say in a previous entry, I still do. It wasn’t something I really was expecting, but I found myself with an early birthday present this week. With my old computer on its last legs (it was having trouble booting into Windows normally), I finally decided that it was on life support long enough, and decided to pull the plug. I found myself in Circuit City, where I got myself a new HP Media Center PC with Windows XP Media Center Edition on it. Right now I’ve got all my stuff migrated over and haven’t really had a chance to play with it and see what it can do. But here’s what it looks like. My friend John’s dad suffered a stroke yesterday afternoon. About the time that I was working to save my computer, Joy writes that she and John and were at Straub, no doubt along with their whole clan, standing vigil at the ICU. Eric just let me know that Mr. N is stable…will probably have to stay in the ICU for a while but is on the road to recovery. Joy recently lost her father and the whole experience brought back memories for her, pouring salt in a wound that is still healing. And having lost a parent myself to illness, it hit home as well. The full story of what I went through during my father’s illness will have to wait for another entry, but for now I pray that John’s father recovers. My thoughts are with you, John and Joy, during this time. If there’s anything I can do, just ask. There’s probably an unwritten state law somewhere that says that all Hawaii residents must visit each of the four largest islands in their lifetimes. Of course, I live here on Oahu, and I have a large part of my family on Maui. And like many people my age, I’ve visited the Big Island in fourth grade. But the one island that eluded me was Kauai. The Garden Isle was always the island to the west that I had only heard about and seen in pictures, but never experienced firsthand. That is, until Saturday, when I decided to play the role of tourist and with a minimum of luggage, hop a plane and spend a day on Kauai. Did you ever get the feeling that everything is breaking down? Man, what a day…you’d think it was a full moon, the way people were calling in today at work. The phone was ringing off the hook. I fielded about 17 calls in the first two hours of the morning…some days I’m lucky to get even half that for the whole day. Then in the late morning I had to go to a team meeting for about two hours, and came back to find seven voicemails in the my mailbox…eek!